Pacific Cataract and Laser Institute has been providing laser vision correction to optometry-referred patients since 1996, when the excimer laser was first approved by the FDA for refractive surgery. Over the course of 14 years and almost 70,000 procedures, our surgeons have learned a great deal and implemented several important innovations that have improved our results. In addition, important advances in corneal shaping technology have enabled us to provide superior visual outcomes. However, rapid evolution of sophisticated instrumentation, coupled with the influences of industry and consumer marketing, has created some confusion for patients and comanaging optometric physicians. With optometry playing such a key role in managing laser vision correction patients, clear understanding of current technology is essential. In this short article, I hope to provide a simple but accurate discussion of the options. When we first started laser vision correction, broad beam excimer lasers were used to reshape the cornea. A large beam of laser light (6 to 8 mm) was focused on the treatment area and controlled by an expanding diaphragm. The aperture started small and enlarged throughout the procedure. 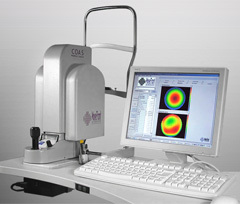 Broad beam laser technology tended to produce corneal irregularities and increase the degree of high order aberrations. Recognizing this early on, we developed creative techniques that minimized the ill-effects, resulting in many happy patients. However, we were glad when better technology became available. Scanning or flying spot excimer lasers are now the most advanced technology. Utilizing small-diameter (0.8 to 2 mm), computer-controlled laser beams, these systems have the potential to produce the smoothest, most precise ablations. When patients require customized treatment, the sophisticated computer control of our scanning laser system allows for tailor-fit ablations—based either on wavefront or corneal topography measurements. 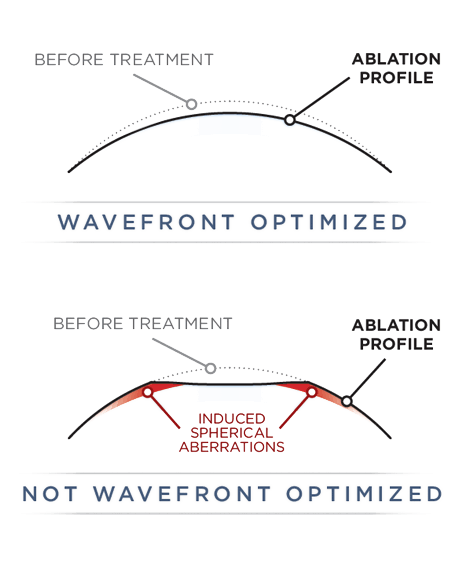 Many refractive surgeons perform "wavefront customized" ablations on most of their laser vision correction patients. It is easy to understand that, given the option, consumers would rather have a customized procedure. However, we prefer "wavefront optimized" ablations for the vast majority of patients. Let me explain our thinking. Wavefront customized (or wavefront guided) ablations are based on measurements of the wavefront scan. Before surgery, a detailed map is made of all irregularities found throughout the optical system, including the corneal surfaces and crystalline lens. This map is then used to create an ablation profile that will neutralize total optical aberrations—both lower order (ametropia) and high order. At least that is the theory. Aside from accuracy being lost to these variables, we do not feel most patients are best served by corneal reshaping that corrects for aberrations found within the crystalline lens. If the lens continues to change, or needs to be replaced with an IOL later in life, the customized corneal shape could cause visual challenges. We believe wavefront customized treatment is best reserved for patients with significant and specific optical aberrations in the cornea that can only be addressed with this procedure. In our experience, this involves a very small number of cases—primarily those suffering with significant high order aberrations from previous surgery such as corneal transplant, RK, AK, LASIK and PRK. Because customized treatments typically require deeper ablations and wider treatment zones, thinner corneas and larger pupils may be relative contraindications. Wavefront optimized ablations are our preferred treatment for most patients. The ablation profile is optimized from the results of many cases to avoid inducing high order aberrations. 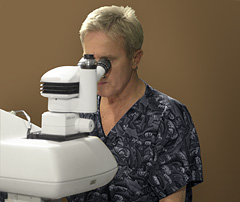 Surgical correction is based on careful phoropter refractions and uniquely blended into the periphery of the cornea. A more peripheral ablation preserves the natural aspheric or prolate (rather than oblate) shape of the cornea. Excellent results are achieved in correcting ametropia while minimizing high order aberrations such as spherical aberration, coma, and trefoil. Glare, haloes, and other nighttime visual symptoms are minimized. When customized laser vision correction is indicated, our laser system allows us to create treatment profiles based on either wavefront or corneal topography. If abnormalities are primarily on the corneal surface, we have the option of basing the custom laser procedure exclusively on corneal topography. The vast majority of patients we treat are best served with wavefront optimized laser vision correction. This is our standard treatment and involves no additional cost. Whenever customized treatment is needed, rest assured, we will carefully select the option that best suits your patient's needs.